Yay! 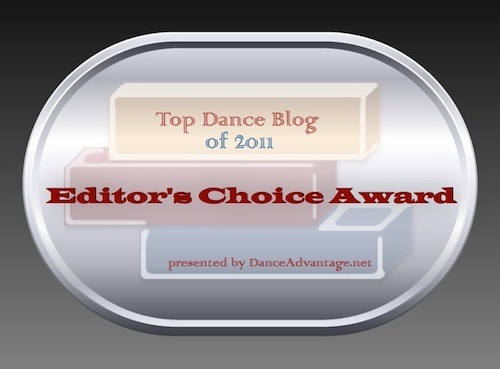 The Dance Buzz was chosen by Nichelle at Dance Advantage as “Editor’s Choice” for the Top Blogs of 2011. Thank you, Nichelle – I was completely surprised and humbled to be chosen! I hope to keep bringing good stuff to my readers in 2012. Be sure to check out all the dance blogs that entered the contest – there are some really great ones in there to add you to your blog roll. 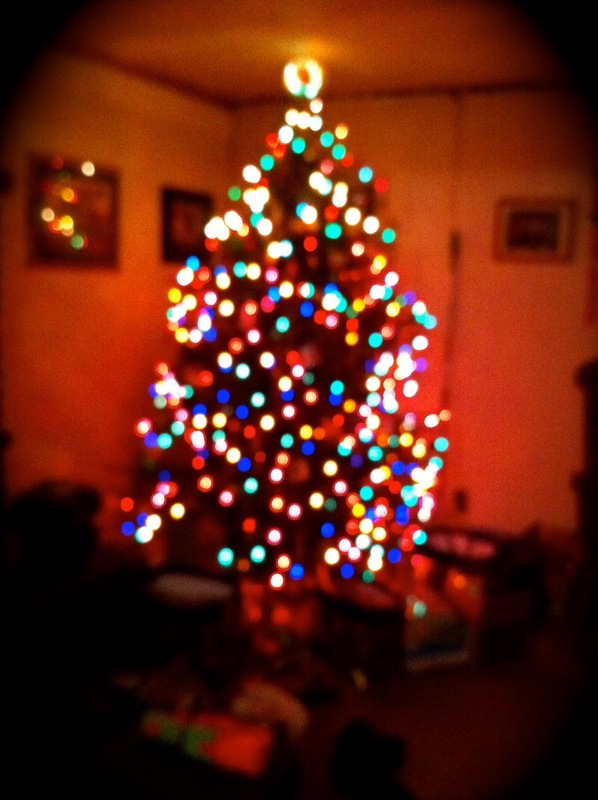 I hope everyone had a very Merry Christmas! The Dance Buzz and hubby traveled to Western New York for the holiday to visit Mr. Dance Buzz’s family. I can’t believe how quickly the end of 2011 is rapidly approaching… I spent the day at the studio preparing recital costume orders, gathering up lost and found items to donate and rehearsing some of our performance team kids who came in over break. Trying to tie up some loose ends before we begin the start of our busy season filled with competitions and recital preparations. Thank you for everyone who commented on our 2011 entry into Top Dance Blogs – we didn’t make the finals for Top 20.. but go on over to Dance Advantage to vote for the blogs who did! I’m excited to find some new blogs to add to my blog reader. If you want my advice (and why wouldn’t you? ), The Dance Buzz’s favorite blogs on the list are Maria’s Movers and Adult Beginner. If you don’t know who to vote for, I recommend one of these blogs! But don’t take my word for it, check ’em out! SURPRISE COMING SOON… GET READY! I have somewhat of a surprise for other bloggers to be revealed this week that I hope will inspire some dance bloggers to participate! Sorry, can’t tell you now… you’ll have to check back later this week. 2011 Top Dance Blog – Please Vote! 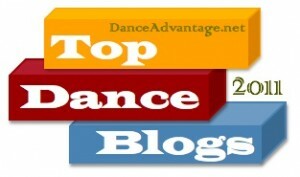 It’s that time of year again… the 2011 Top Dance Blogs Contest – held by Nichelle over at Dance Advantage! Last year, I threw our hat in the ring more as an experiment to see if anyone was actually reading this blog – and I was pleasantly surprised by the number of responses! Ok, so it was only five comments, but five people is way more than I ever expected. So let’s see if we can beat that number this year–it’s up to you! If you enjoy reading this blog, VOTE for The Dance Buzz by leaving a comment below on this post. Thank you for your support! Comments are open until December 20. Top Dance Blogs of 2010 – We need your vote! I’m throwing The Dance Buzz into the ring of contenders for the Dance Advantage’s Top Blogs of 2010 contest. We are entering the “Dance Education/Training” category. To vote for The Dance Buzz, you simply have to comment on this post. Couldn’t get simpler. The blogs with the most comments get named Top Blog. So dear reader, if you exist and enjoy the Dance Buzz blog or our tweets, give us a shout out and a vote and if you’d like, a comment about the blog. Commenting is open until December 22. Nichelle’s Blog Contest really got me thinking. She’s asking people to enter their blogs to win “Top Dance Blog” and in order to do that, you have to put your blog into a category. I realized that when I started this blog three months ago, I naively would have said my category was “Dance”. I didn’t realize the vast number of dance blogs out there that fill every niche and corner. I took some time to reevaluate where I want to go with this blog and narrow my perspective. Looking back at posts, my most successful ones were aimed toward dance teachers and studio owners (iTunes post, playlists, new season wisdom) which is not surprising, considering I am both of those. Starting now, I am going to aim more of my posts towards dance teachers and studio owners. So dear readers, if you are out there, consider this a New Year’s Resolution of some sort–my goal for 2011 is to find my blogging niche and fill it! I hope you’ll come with me and enjoy the journey! Pump up the..oh – sorry, I got a little carried away there. Looking to round-out your blogroll or RSS feeder? Here are a few dance blogs with some interesting perspectives. Happy reading! DancePulse.org – Meg is a Seattle dance specialist working with elementary students in a public school. Her blog offers a unique perspective into working in an education system with dance. Dave Tries Ballet – Just what the title says… Dave is a guy trying ballet for the first time. Infinite Body – A blog on arts and culture by Eva Yaa Asantewaa. She also publishes a podcast called Body and Soul. Dance Pulp – Check out the rest of the site too for interviews and an inside look into the professional dance world. Follow Anyday on Twitter: Tap Dance! If you don’t use Twitter, you don’t know what you’re missing! Twitter can be an overwhelming onslaught of mini-messages, but it can also be very useful to a dancer looking for audition updates or an inside look at being a professional dancer. @TheTapFloor – Tons of tap videos posted almost daily, although it is mostly the same tappers everytime. Bio: If you love tap dance, follow me! @Boogie2TheMusic – Tap dancer posting tap dance links! @TapDanceMadeEasy – Bio: Eli Newsom, Owner/Instructor. I’m here to help to spread the joy of tap dance around the world.